The narrator is Jenny Ryan who is employed by Sholto MacNab, a retired adventurer and Laird of the castle, to ghost write his memoirs. Cauldstane, a beautiful castle is fast falling into disrepair and the MacNabs are struggling to maintain or even keep it. When he employs Jenny Sholto jokes that every castle should have its ghost. 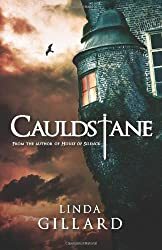 Cauldstane not only has a ghost, there is also the MacNab curse, which affects the women the McNabs marry, with three deaths (two accidents and a suicide) attributed to the curse, and the legend of the Cauldstane claymore, supposed to possess supernatural powers to protect the MacNabs from evil. Jenny immediately falls in love with the castle, but as she settles in a few things begin to disturb her – her notes on her laptop disappear. As she learns more about the MacNabs and their history, family secrets begin to surface. But what is the truth behind these stories? It seems to hinge on Meredith, Sholto’s second wife who was killed in a horrific car crash. 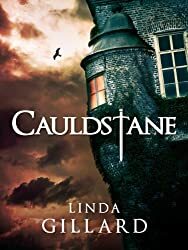 Cauldstane is peopled by well drawn colourful characters, a beautifully described atmospheric setting and a wealth of story-telling, recreating the past seamlessly interwoven with the present. Jenny not only falls in love with the castle, but also with Sholto’s heir, his son Alec and as she does so more strange events occur and it becomes obvious that there is a malign presence in the castle that doesn’t want her there. And it makes its presence known in a modern way – through Jenny’s laptop. No ghostly visions or spooky voices, but a thoroughly evil presence capable of writing on the laptop as well as moving objects and putting Jenny’s life in danger, along with the music that apparently only Jenny can hear. As well as being a gripping tale Cauldstane is also about fear. The epigraph from The Devil’s Dictionary by Ambrose Bierce (1842 – 1914) sets the tone: ‘Ghost: the outward and visible sign of an inward fear‘. The MacNabs are not the only ones with things to fear in their past, for Jenny too has a troubled past and both have to learn how to overcome their fears. Cauldstane is also about loss and revenge, about good versus evil and the power of love. Linda Gillard lives in the Scottish Highlands. She has written seven novels. I enjoyed this one very much but my favourite of hers is still Star Gazing. For more information about Linda Gillard and her books see her website, Linda Gillard – Author. Reading challenges: Read Scotland 2014, My Kind of Mystery and R.I.P. IX. Sometimes I think I can still hear – very faintly – the strains of a harpsichord. Impossible, of course. There’s been no harpsichord at Cauldstane for over a year now. Meredith’s has never been replaced. Never will be replaced. As the cover shows Cauldstane is set in a castle – a Scottish castle, a remote and decaying 16th century castle, the family home of the MacNabs. Ghostwriter Jenny Ryan is commissioned to write the memoirs of the current Laird, Sholto MacNab. There are secrets, sins to be revealed – and an ancient curse. If you want to know more about Linda Gillard’s books here is the link to her website.